Bike Because Queen Said So! With World Bicycle Day being June 3rd, it only seems right. The weather is getting warm, the smell of burgers and brats fill the air, and you’re ready to bust out your bicycle. New or old, tandem or unicycle, red or green, Trek or Schwinn, you’re ready to hit road for another summer – determined to finally complete that triathlon you’ve put off for the last 3 years. Hold on cowboy - before you mount your horse let’s get a few things straight regarding proper bike fitting. Bike fit varies a lot based on your primary goal: recreational riding vs leisure riding. See below for a great graphic illustrating this from article recently published by the Wisconsin State Journal (2018). In general, seat height should be set with the goal of achieving a 25-30 degree knee bend; specifically avoid your knee going past your toes. This reduces risk of knee pain and makes for optimally efficient riding (Bini et al., 2011). On the contrary, setting your seat too low will result in greater overall fatigue and higher risk for anterior thigh/knee pain. While research has shown upright trunk positions are most comfortable for riders, it obviously results in less advantageous aerodynamics (Priego Quesada et al., 2017); again, your goals should drive your bike fit – no pun intended. If you have further questions, please stop in your local APSTM for a FREE 15-minute screen and pick our providers’ brains in order to optimize your summer biking experience. 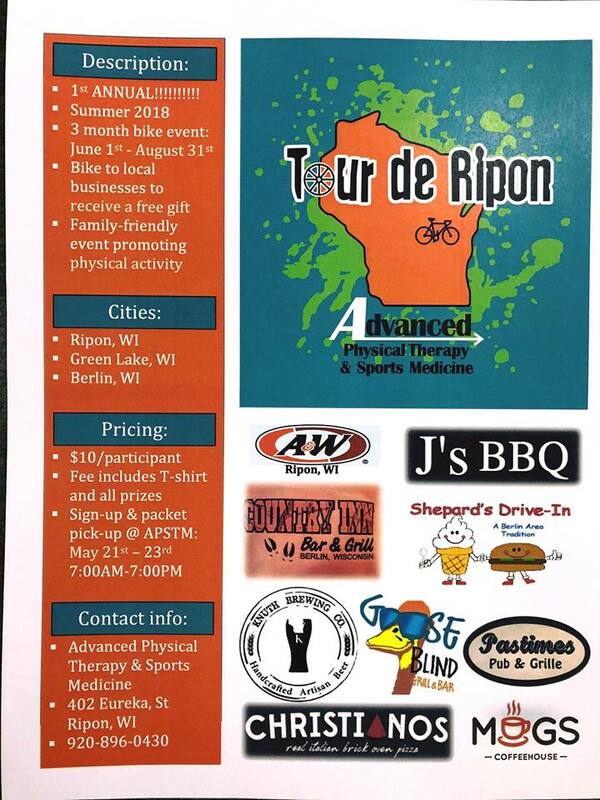 Also, please be sure to look into our Tour de Ripon bike even going all summer in the Ripon area; sign up, bike to a restaurant, and get incentivized with free food & drinks! The event runs from June 1, 2018 – August 31st, 2018 – sign up anytime! More info available on our website and Facebook page. Bini, R.,Hume, P., Croft, J. (2011). Effects of bicycle saddle height on knee injury risk and cycling performance. Sports Medicine: 41(6), 463-476. Kittner, G. (2018). Time to Tune Up. Wisconsin State Journal. Priego Quesada, J., Perez-Soriano P., Lucas-Cuevas A., Salvador Palmar R., Cibrian Ortiz de Anda, R. (2017). Effect of bike-fit in the perception of comfort, fatigue and pain. Journal of Sports Sciences: 35(14).